The Civil War is full of both tragic and heartwarming stories, most of which never made the pages of newspapers of the day. Personal experiences were typically eclipsed by battle reports of the day. 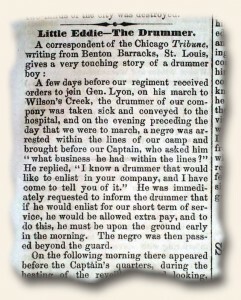 But the story of little Edward Lee, the drummer boy, found the pages of “The Crisis” (January 29, 1862) newspaper from Columbus, Ohio, and can also be found on many websites. Read the full story to get but a glimpse of the tragedy which happened on a daily basis during this troubling period in American history.